16 April 2011: Since 2007, neighbourhoods in London have the right to form councils responsible for their own community governance. These parish councils, which already exist elsewhere in England, have substantive powers and serve populations of a just a few thousand. Envisaged as a mechanism for residents to take greater control of their lives, there has been a positive response from communities and several new councils are proposed. There appears to be a political consensus on the value of these councils, should communities decide they want one. However, there is apparently no political will to systematically create them across London and existing local authorities are at best indifferent to them. This could potentially mean the communities that need them most will miss out. 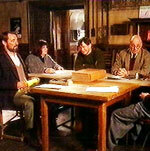 Parish councils have existed in rural parts of England since 1894. Their raison d'être was to provide some local control for small communities who received the majority of their local government services from distant county and rural district authorities. As interwar London suburbia expanded across open fields, part of the rural way of life that was swept away were the parish councils, which were all abolished in the outer suburbs by 1935. When Greater London was formally created in 1965 it must have seemed an efficient measure to eliminate parish councils from the legislation, as none had existed for thirty years. Most of the history of parish councils therefore takes place away from London. Over time they have evolved and are now permitted in urban areas, and their number has been growing since 1974. They are able to go by a variety of names including town, village, community or neighbourhood. The powers available include planning oversight, maintenance of open spaces and provision of community infrastructure. The services they provide are funded by a local tax known as a precept, with a typical charge per household of around £30 ($50) a year. In 2007 the prohibition of parish councils in London was lifted. There are around ten or so prospective parish councils in Greater London. The vast majority are in the higher density Inner London area. All are at a very early stage in their development, with a proposal for Queen’s Park in northwest London the most advanced and coherent. The process of creation takes at least a year and requires the local authority to undertake a review of governance arrangements. Rich and poor live amongst each other in almost every district of London and the proposed areas on the whole reflect the diversity that is found even in a very small area. A recurring theme in the proposals is a feeling that the existing local authorities, the 32 borough councils, have failed to respond to the needs of a particular area. Three concerns are voiced by residents in the proposed areas. They are the level of increased taxation, as Londoners already pay a local tax to two existing authorities; the legitimacy of proposed boundaries, as the neighbourhoods in the urban sprawl are not separately defined other than for electoral purposes; and the range of powers that would be available. The Localism Bill, which is currently passing through Parliament, potentially gives parish councils increased powers over planning. It is proposed that the planning system will move from a consultative model where parish councils are a stakeholder in the process to them having direct involvement with the production of neighbourhood plans. In order to ascertain the likely success of these councils there are a number of places we can look. Firstly the urban fringe around London is almost entirely served by parish councils. Chigwell, Loughton and Buckhurst Hill, all on the London Underground and part of the urban area, have parish councils created relatively recently. There are a scattering of parish councils in the metropolitan areas surrounding Manchester and Birmingham. However, the Buckinghamshire town of Milton Keynes provides the exemplar for the development urban parish councils, with the entire new town covered, following a review by the borough council. The local authority there sees the councils as a way to reinforce community identities and provide a framework for consultation and delivery. The Milton Keynes experience mirrors the development of community boards in New York. These were systematically created in every part of the city. However, their powers are not as far reaching as those proposed for London and they lack the variable tax raising powers. It is unlikely that the community councils that will be formed in London will be the result of a sweeping reform of community governance, unless a borough council decides to lead the way or the mayor of London is minded to encourage localism of this form. Most likely the development of these councils will be piecemeal and from the bottom up. The debate surrounding the introduction of elected mayors in UK local government is one which has polarised both local government itself and the academic and policy communities the most among all others. Fewer topics elicit such vexatious argument and yet evidence-based debate is thin on the ground. What is needed is less fixation on constitutional issues and more on the difference mayors are actually making in their communities. Here we present our findings based on performance management ratings. 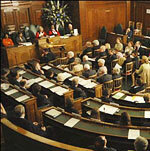 The UK government has in its 1998, 2001, 2006 and 2008 local government white papers affirmed its view that elected mayors represent the best form of council leadership, yet has been largely unwilling to promote the idea beyond these documents, save for the odd legislative amendment here and there. Think tanks issue an array of exasperated reports, usually based on opinion poll data, calling on reluctant ministers to act more decisively and the public, for their part, mostly show indifference  as evidenced in the low response rates to the recent consultations on introducing more elected mayors and unsurprising given the imperceptible effect local governance theory has on people’s day to day lives. Yet for all the platitudes aired, there is little to show for any kind of actual deep assessment of the difference elected mayors might have made locally.